Scorched Earth is strictly protected by copyright. Set on an estate, ironically named World's End, the plot has it that the government will expropriate the property which has been in the same family since the time of the early English settlers' arrival in the province (of Natal). 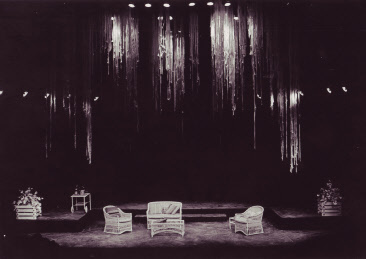 As a scenario prophesying decadent disintegration at a family level, brought about by enforced reform, as well as corruption, the play has frightening implications. Neither Tennessee Williams nor Arthur Miller could devise a more fecund and dramatically exploitable family situation and the device of using a TV crew who arrives to film the last days of this vanishing era is crisp and ingenious. Scorched Earth goes some way to confronting in the medium of a realistic play about a Natal WASP family who once supported the Nationalists and now find their birthright being given to a bantustan. The play represents a major transition in Uys towards maturity as a playwright. The range of styles in the dialogue and the adult complexity of the situation are utterly absorbing. Pieter-Dirk Uys has a dependable knack for immediacy. Scorched Earth is the latest in a long line of plays and revues that reflect this darting, magpie talent ... humour is the weapon he wields most skilfully ... one of our most prolific playwrights. Pieter-Dirk Uys's latest is a major opus concerning dispossession, displacement and corruption in high places. There is some remarkably fine writing.